Our breakfast plans were to get pastries, tea and coffee from Morning Glory. Croissants and sticky buns were available, but the bakery was completely out of black tea, which is pretty ridiculous. Service there this year has been as lackluster as usual, but what’s really taken a downturn is the tea selection. I used to be able to get Earl Grey or even some more exotic teas like White Peony without a problem, and this year they can’t even keep a simple breakfast blend stocked. Good thing their pastries are still consistently fresh and tasty. The Trailhead Cafe earned our business again, this time for tea (Earl Grey) and coffee (Dancing Goats). What’s with people discovering “our” gazebo?! It was occupied again this morning, we we carried our snacks and drinks to our benchmark bench near the seawall. A yacht was at the pier and the crew of the Margaret Todd was getting the schooner ready for the day’s first sailing. We had less time than usual to spend lounging around at the pier because we expected my father’s arrival in the early afternoon. 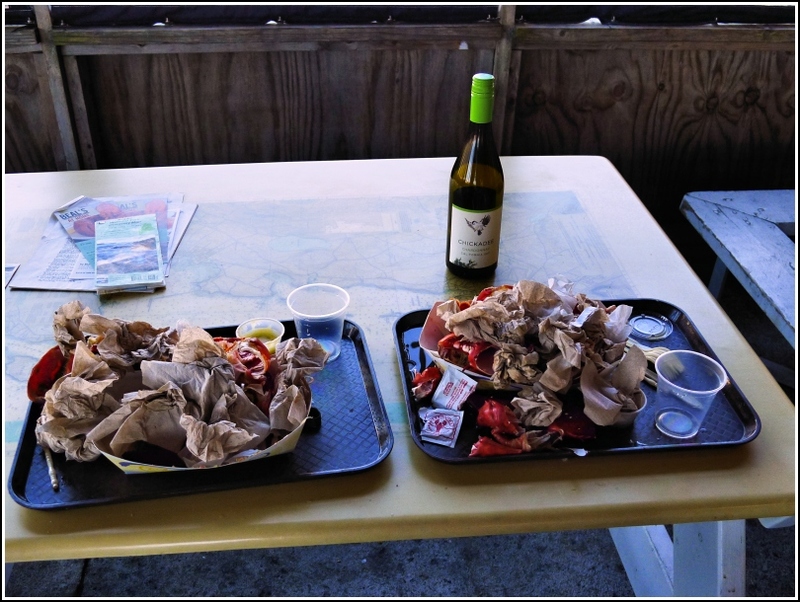 Our plans were for a lobster lunch in Southwest Harbor at the usual lobster pound, Beal’s, while we waited for dad. First, though, I wanted to check out the pier because I thought I had remembered seeing a temporary bench mark labeled on the MaineDOT map in the north corner of the pier, just a few feet from TIDAL 11. I wasn’t even sure what the marker itself would be. Sometimes they are simply crosses cut into the top of bolts, or other markings that are easy to miss, especially if you don’t have a description. 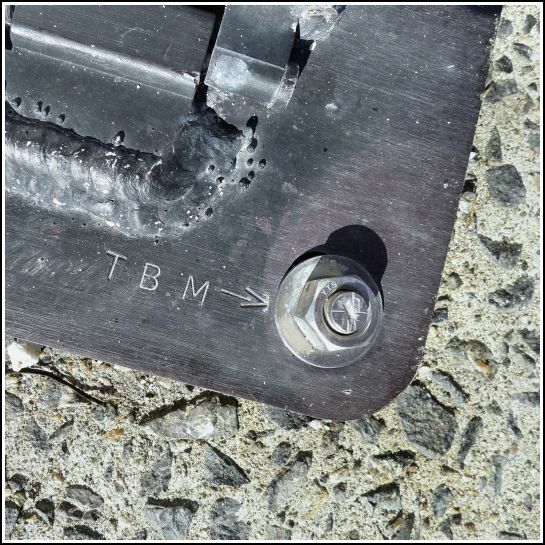 But we spotted this one right away: it was indeed a cross cut in the top of a bolt, and it was conveniently labeled T.B.M. 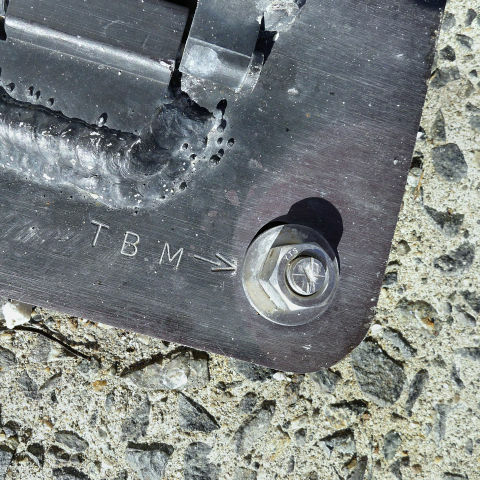 (temporary bench mark) with an arrow pointing to the bolt. 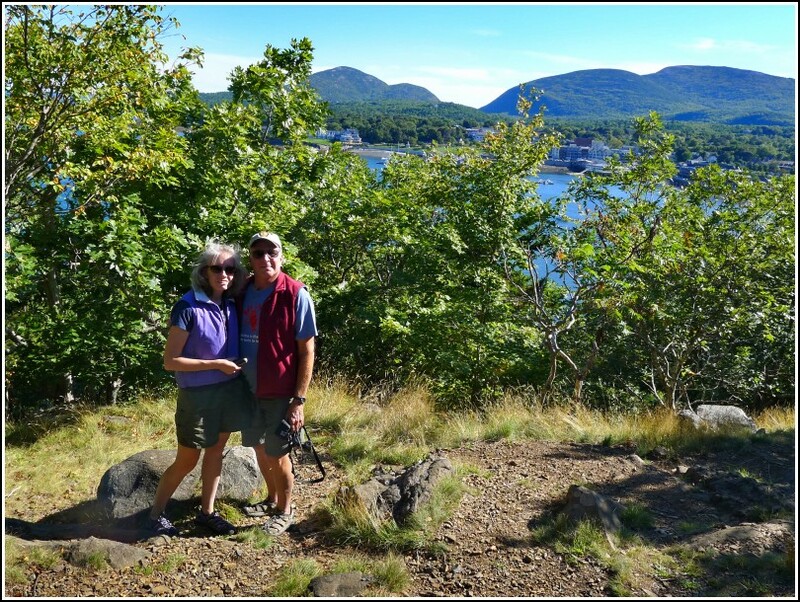 Before long, we were on our way to Southwest Harbor. All along our route we saw evidence of recent road construction. Then, in Somesville, signs indicated heavy delays ahead. “Nothing gets between me and my lobster!” I said, but actually, the traffic slowdown did. We waited at least ten minutes until the traffic in our lane was cleared to move through the single-lane road. Before lunch, we poked around in Sawyer’s old-time market and bought my mother some of the sharp cheddar she’s been dying to have since she finished the portion she bought here last year. We also bought ourselves some Olga (our favorite cow and sheep’s milk cheese) and Lamb Chopper. Then, finally, it was time for lobster! We had heard that the chef from Jordan Pond House had been ousted with the takeover of the new management and had ended up as the chef at Beal’s. Chef at Beal’s, we wondered? What’s that about? It was a typical lobster pound with really no need for a chef. We were so curious about this. We talked for a few more minutes about the situation and we noticed that the place has a different feeling to it, but in a good way. It’s cleaned up a bit, but not “gentrified” and the food was just as good as ever. 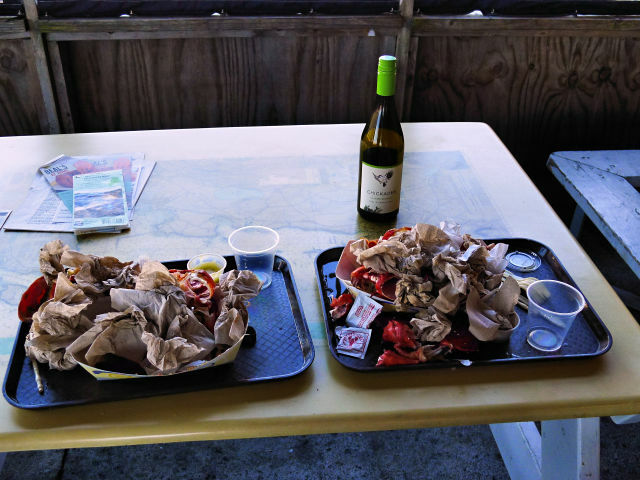 Once our lobsters were out of the steamer we enjoyed them with a bottle of Chickadee Chardonnay and ended up “lobster drunk” (definitely more from the lobster than from the wine!) as usual. While we ate, we got a message that my father had arrived on the island. We were delayed for a shorter period of time on the way back, and we met up with him right around 2:00pm. Dad was full of stories from his trip up north, which included his adventures on the cog railway up Mt. Washington and at the Moose Brook Motel. And his inability to find anything better for supper in Gorham, New Hampshire than a chef’s salad from Walmart. At mid-afternoon it was nearly low tide and a perfect time to cross the sandbar to Bar Island. This is a walk dad has wanted to do since his first visit here, and one Rich and I haven’t done in several years even though we have wandered out on the sandbar plenty of times since. The hike to and across Bar Island is easy and short and lots of fun on a warm sunny day. Views back toward town give a different perspective that you otherwise see only from a kayak or perhaps another boating excursion in the harbor. 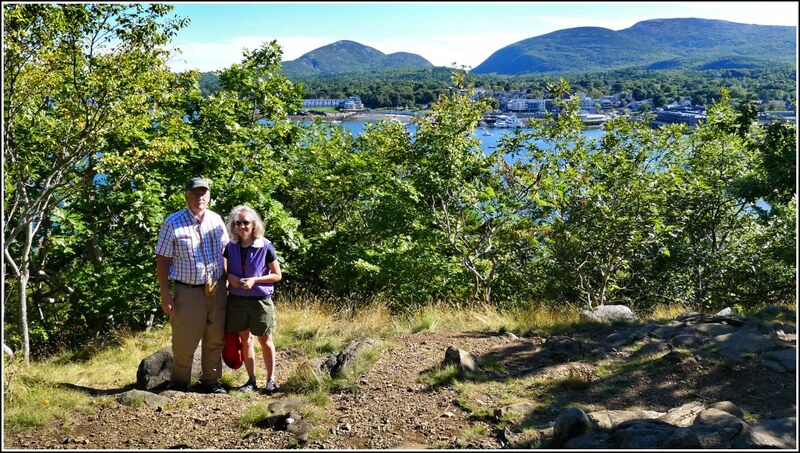 We “summitted” Bar Island’s whopping 90-foot elevation before strolling back into town, stopping briefly at Cadillac Mountain Sports, and then, because we simply couldn’t resist any longer even though it was only 4:45pm, visited Rosalie’s for our second pizza supper of this trip. Dad finally sees Bar Island up close! We shared two small pizzas (one plain, one sausage) and a pepperoni calzone (that was mostly for dad) and of course each had a Shipyard Export Ale. We finished off the evening with a walk around town, blueberry basil sorbet for me and toasted coconut ice cream for Rich, and a soft blueberry swirl for dad, which we ate while sitting on a bench along Main Street and watching a woman from Texas smack into another car twice while trying to park.